This is a real mixed bag of fleece. Some of the locks are long and slinky, some are short and crimpy but it all went into the carder together. Jo's socks were made from wool that Jo picked up in a field while she was on holiday. That worked out so well, Jo and I couldn't resist picking up loads more on a walk in the Peaks. There's a real variety here but altogether it's very nice. I'm still new to dyeing, and want to see how differently things work out if I dye the skein of spun wool rather than the carded fleece before spinning. 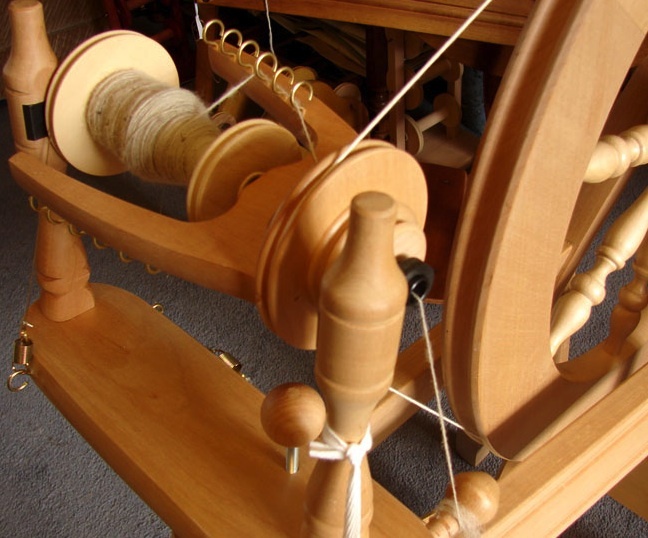 So here's the undyed fleece being spun. For a nice cosy hat, it'll be a little bit thicker than the sock yarn. Just fab to see you creating yarn from found fleece. Looking forward to seeing how it turns out! Wondering if it takes long to collect the right kind of woolly goodness...leave all the coarse stuff and just pick the softer stuff??? You're right - there's lots of coarse or hairy stuff lying about, but the more selective you are the longer it takes. We didn't particularly spend time walking around collecting it, just picked up what we were walking past, and that has yielded 150g of carded fibre. Hopefully that will make the finished item a little more interesting for the recipient.